ארמניה היא מדינה הררית וללא ספק אחד מיעדי התיור והטיול המרתקים ביותר שיש לקווקז להציע. היא שוכנת בדרום רכס הרי הקווקז במפגש שבין מזרח אירופה למערב אסיה. זהו טיול מעמיק אל ארץ יפהפייה, המצטיינת בנופים הרריים ובוואדיות עמוקים. ארמניה גם ידועה בארכיטקטורה המיוחדת של כנסיות ומנזרים עתיקים הבנויים מאבן. Arrival at the Zvartnots airport. Meet and greet transfer, accommodation at the hotel. 11:00 In the morning meet your tour director and start city tour around Yerevan. Visit Tsitsernakaberd. Walking through Memorial park and visit museum of the victims of Genocide. Drive to Echmiadzin – the place where the only Begotten descended. Holy Echmiadzin is the whole Armenians’ spiritual center and one of the centers of Christianity all over the world. 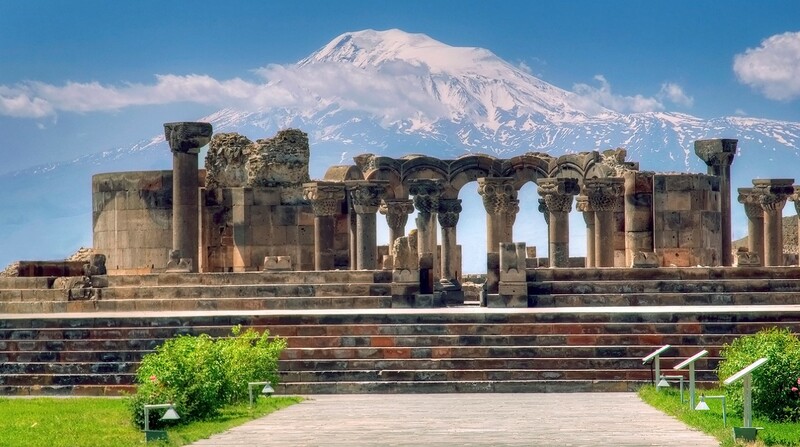 Return to Yerevan with a stop at the ruins of Zvartnots temple – the pearl of the 7th century architecture which is listed as a UNESCO World Heritage. Overnight in Yerevan. 09:00 Drive to Geghard monastery inscribed in UNESCO World Heritage list. Geghard monastery is the unsurpassable masterpiece of the 13th century Armenian architecture. Some of the churches of the complex are masterfully hewn in a huge rock. Due to its construction Geghardavank serves the best place for singing spiritual songs. The complex is rich in subtle sculptural embellishments and many striking khachkars (cross-stones). 13:00 Lunch at a local house in Garni where you will have opportunity to watch Armenian national bread “lavash” baking and barbeque making process in the underground stove called “tonir”. 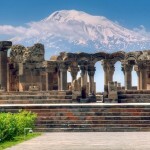 Departure to Garni Temple. Garni temple which towers over a triangular cape, is the unique survived example of heathen culture in Armenia. After adopting Christianity in 301 the pagan temple lost its significance and the fortress of Garni became the summer residence of the kings. Nowadays the ruins of the royal palace and the bathroom with a stunning mosaic work can be found near the temple. Return back to Yerevan. Visit to Vernisage which is the perfect place to get a little taste of Armenia and a unique scenario to witness the fusion between national traditions with contemporary taste. Free time to enjoy a cup of coffee or a glass of beer in one of the nice terraces of the cosmopolitan city of Yerevan. Overnight in Yerevan. 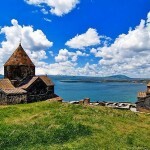 09:00 Sightseeing tour to Khor-Virap monastery the importance of which is connected with Gregory the Illuminator, who introduced Christianity to Armenia. It is a wonderful masterpiece situated on top of a hill. It is a pilgrimage place where every year a lot of tourists and native people visit. It looks like a castle where everybody has the hint to sit and dream while admiring the beauty of the church. The highlight is the best view to the biblical Mt. Ararat. Continue tour to Noravank monastery – religious and cultural centre of 13th c. It is situated in a narrow gorge which is known for its’ tall, sheer, brick-red cliffs, directly across from the monastery. The beauty of this monastery is appreciated by thousands of visitors not only because of its’ architecture and history, but also for its harmony with surrounding fabulous nature. Drive back to the capital city. Overnight in Yerevan. 09:00 Early departure from Yerevan to Lake Sevan, about 70 miles north of Yerevan. 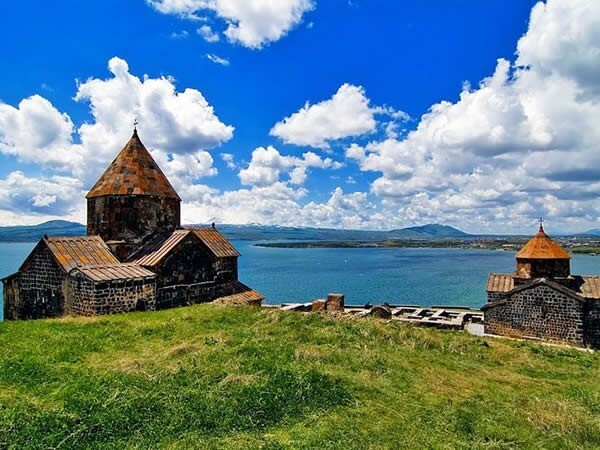 Lake Sevan is one of the largest freshwater alpine mountain lakes in the world. The beautiful landscape and the crystal water serve nice preconditions for excellent rest. The lake is also famous for its peninsula and medieval church complex built in 874. It is worthwhile to climb up the many stairs for the view and the green khachkars. They were carved from a plentiful local green stone and stood out from the others which are all made of tuff (local stone). Visit also to Noratous, ancient cemetery with medieval khachkars (cross-stones) dating back to 6th c. Drive back to Yerevan. Optional visit to Fruit Market or Cafesjian Show Room. Overnigth in Yerevan. Day 8 / Fri: Departure home! טיול מאורגן בקבוצה בינלאומית הוא טיול מאורגן המתחיל ומסתיים בחו”ל. זה טיול בו המדריך הוא מקומי דובר אנגלית ושפות נוספות, המטיילים יכולים להיות מכל העולם, בד”כ יש מגוון תאריכי יציאה והמחירים זולים לעין שיעור ממחירים של טיולים מאורגנים היוצאים מן הארץ. זה סוג אחר של טיול, טיול המתאים לאזרחי העולם הגדול, המחפשים להכיר תרבויות שונות, אורחות חיים מקומיות בארצות היעד, רוצים לטייל בדרך אחרת עם אנשים שבאמת מעריכים טיולים. נסו לטייל ככה פעם אחת ולא תרצו לטייל באופן אחר! להלן טיולים אופציונליים ליום החופשי – במידה ומעוניינים באחד מהטיולים, מומלץ לשריין מראש את בחירתכם. Departure to Ashtarak (meaning “Tower” in Armenian) is spread out in and above the gorge of the Kasagh river. The town of Ashtarak has the little church of Karmravor, a cute ancient little red tile roof church. 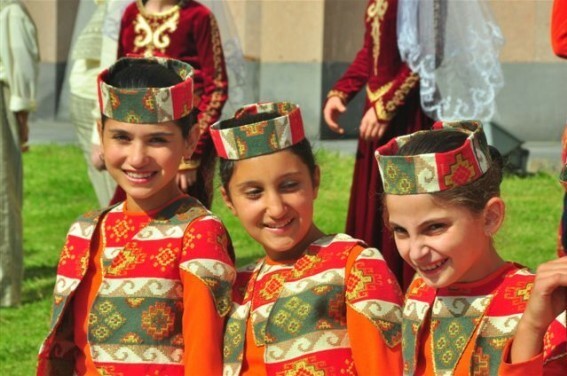 During this tour you can enjoy a coffee stop at one of the local’s houses to also watch Armenian traditional sweets and marmalade making ceremony. Drive to Hovhannavank, the Armenian Apostolic church monastery which is dedicated to John the Baptist, whom Armenians venerate as their patron-saint. Continue to Amberd. The princely fortress of Amberd was built in the 11th to 13th centuries. Next to this secular edifice there is a church built in 1026 by the duke Vahram Pahlavuni. Drive back to Yerevan. Overnight at the hotel in Yerevan. NOTE*: Amberd fortress is reachable only starting from end of May until end of October. Start the tour with the visit to Talin cathedral of the 7th centuay. Aruch is a town located on the southern part of Mount Aragats. The town dates back to the 6th century when it was the winter camp of the royal armies. It was later made to a permanent base by Grigor Mamikonian (661-682). 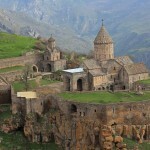 The village is the location of the 7th century Armenian monastic complex Aruchavank. There are also remains of the Mamikonians’ palace. Drive to Gyumri. Visit the old part of the city and walk through the Street of Masters. Gyumri is the second city of Armenia and is famous for it’s architecture the old part of it dates back to the 19 th century. Drive back to Yerevan. Overnight at the hotel in Yerevan. Haghpat – situated not far from Sanahin the monastery of Haghpat has its significant place in the historical and cultural life of Armenia. It was built during the reign of king Ashot Bagratuni. Numerous valuable manuscripts and miniature paintings have been produced in the scriptorium of Haghpat for many centuries. Sanahin – the monastery of Sanahin is on the right bank of Debed River. This architectural complex consists of several churches, seminary, book depository. Drive back to Yerevan. Overnight at the hotel in Yerevan. 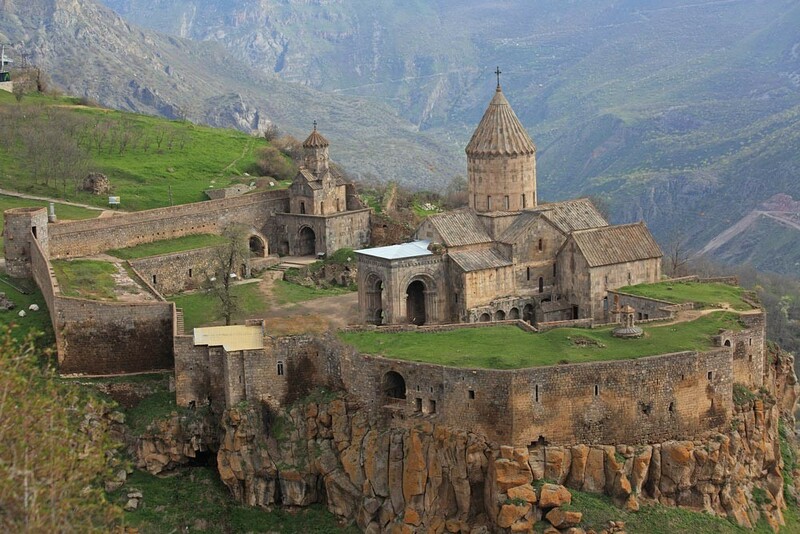 Excursion to the monastic complex of Tatev (Cultural Heritage Site by UNESCO). Take the ropeway from Halidzor Village and go to the monastery above the beautiful Vorotan canyon. Tatev is an architectural masterpiece dating from the 10th century and is often called a monastery built on the edge of nothing. Tour to Karahunge (Stonehenge), ancient observatory 6mil B.C. It is located at 1770 m. above sea level and occupies 7 hectares of territory. The monument consists of about 223 basalt slabs of which 84 have 4-5cm long openings in them (which, for Stone Age, have been rendered with incredible smoothness). Drive back to Yerevan. Overnight at the hotel in Yerevan.